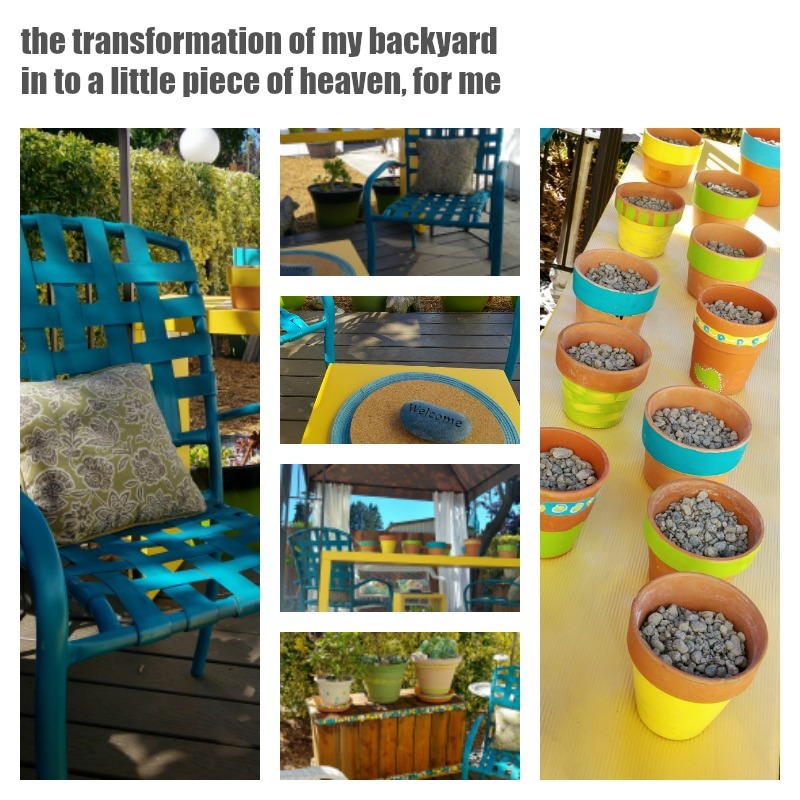 Yard Makeover - Project Done - Getting back into my Studio! I moved in to my home (a spacious and 8 year young manufactured home) December 2015. And after a year the house interior is just about perfect. I've shared one of my DIYs here. But the yard was a sh*tshow! so that I could play and design it the way I wanted it! Here you see it - the scruffy weedy gross BEFORE and the cleaned up rather blank slate of an AFTER. 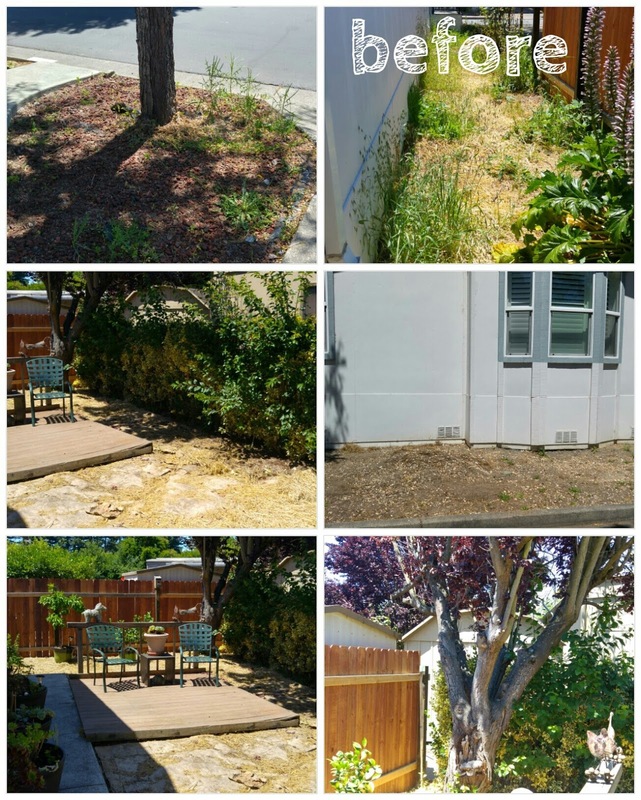 My poor flowering plum tree had long been neglected so she got a good topping and trimming, too. And I needed some curb appeal, so since I have a "thing" with succulents, and they are so perfect for our dry and drought-prone area, and gosh, they are so cute!!! I built some planter boxes and filled some resin barrels I had and decided the front yard was going to be a succulent showstopper. They are rough, oh yes, but all the wood was free. It split like crazy, then my cousin told me some different type of screws to use, and that helped. Omgosh, to use my power tools again was a hoot! 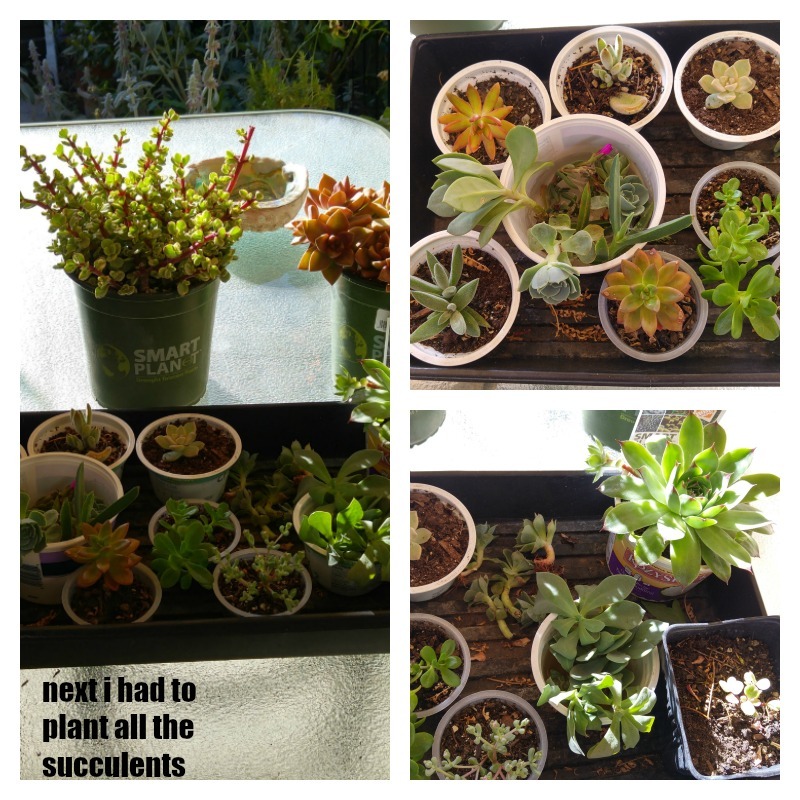 My friends brought me all sorts of their succulent cuttings, and I had quite a few as well. Only had to buy a few plants from Home Depot. 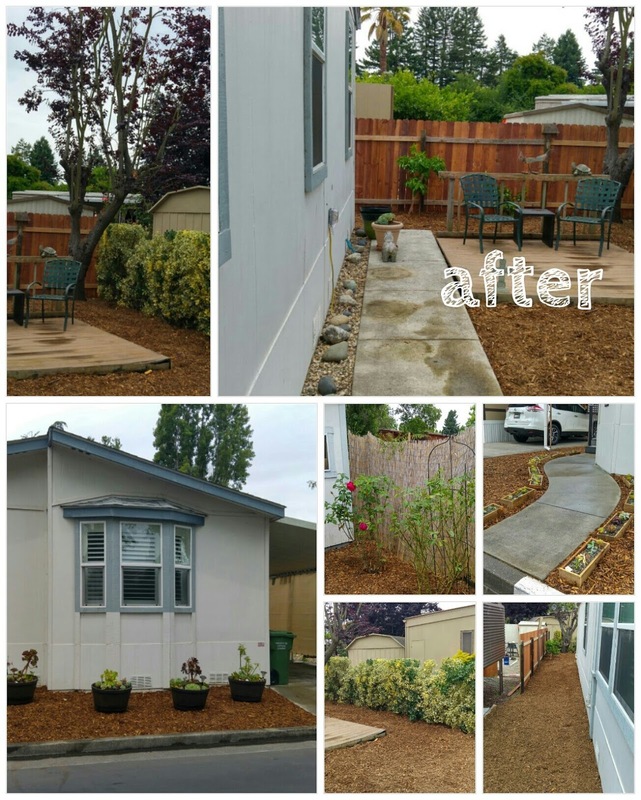 so the CURB APPEAL PROJECT was essentially FREE. Now are you ready for the absolute Best-ist part of this makeover? My little piece of heaven. This is it! 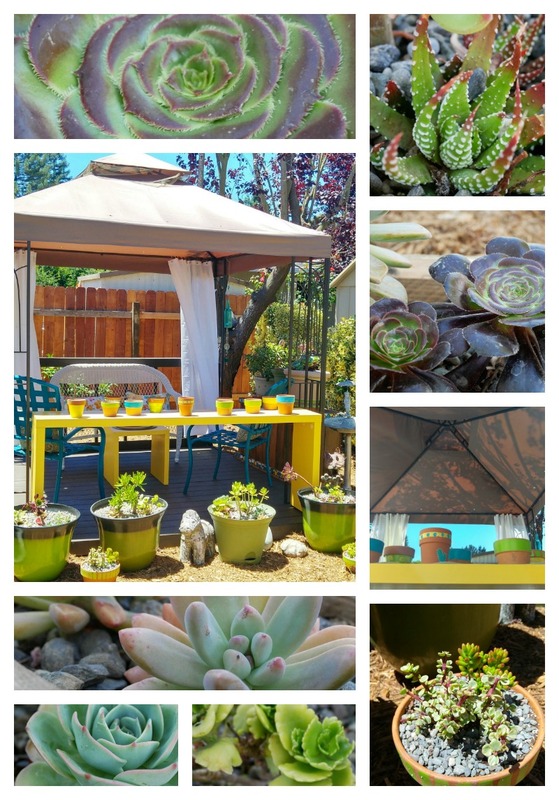 I planted all the succulents in containers, it uses less water, it's weed-free and my landscaping maintenance is as low as possible while still having some beauty around me. So there you have it. Now I am committed to being back in the studio. I painted the deck a coffee brown opaque stain. Spray painted (ugh, i HATE toxic spray paint!) the two chairs. I found that long yellow table shelf thingy at Good Will for $15 and painted that and that little table a sunny yellow with exterior paint. hung a couple of wind chimes. gazebo i scouted online for $199. not bad. And my friend Nancy helped me set it up and lag bolt it down. The landscaping cost me a bunch, but the rest of the decorating was either free, thrifted, or pretty doggone affordable. Phew! 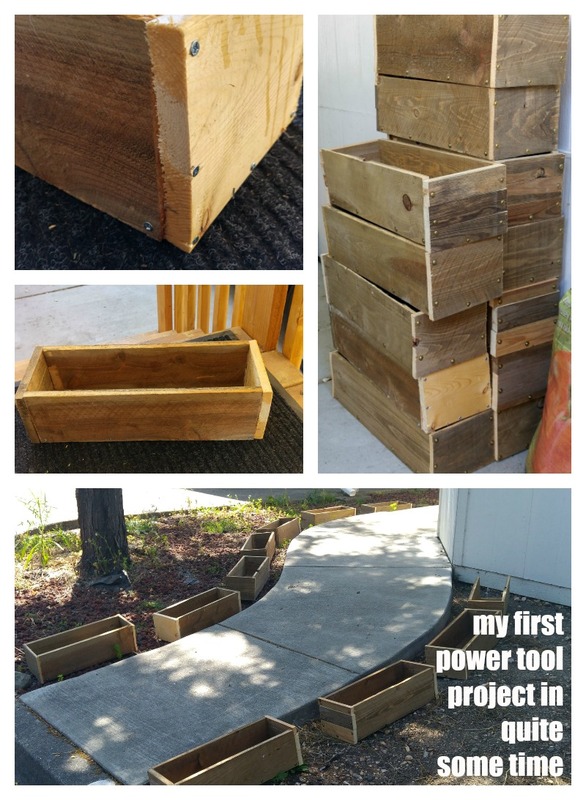 I do have one more outside project for later this summer (when things cool down) and that is clearing out my shed and setting it up as my tool/wood/framing workshop. Stay tuned! It looks good Joanie. A really nice environment. Cheers. Looks like a lot to take care of, much time to keep it beautiful. Start painting again soon. You have created a wonderful place to do so but watch out that it doesn't demand too much of your creative time, like having a wee one to take care of. Thanks for sharing. It looks beautiful!! 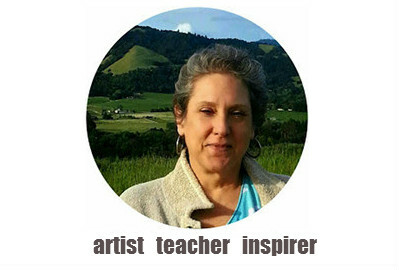 Is your studio space inside or will that be in the shed you are setting up? Great Job Joanie!! A really nice spot for you to relax and enjoy...and I hope you do! Looking forward to seeing some more art from you now! Happy July! I am so loving it! Good choice of home and love your choice of succulents. You have given me a great idea for those plants I have in pots that just can't seem to survive our hot summers. I too live in a manufactured home (bought new 13 years ago)and I am constantly looking for ways to simplify the yard to leave me more time in the studio! I love it, them...all! Low maintenance is the way to go. I love succulents, and you have some beauties! Congrats! Yes, i am loving having my own home (never thought that would happen again being that I live in absurdly expensive California) but here I am. But definitely everything I am doing is LOW MAINTENANCE as I am committed and passionate about making art. As for my shed, that is going to be a workshop for my wood, tools, making frames, messy gesso work, that kind of thing. I will undoubtedly share that process too. My daughter is moving to Washington state this summer as she has a teaching gig at a college up there. After she moves her stuff out, that shed is as good as transformed! If I am feeling brave enough I may even show you the horrific mess it is now, Before and After drama. Smile. Hi Dolores, there is no getting easier than succulents, methinks. And when I read that adding pea gravel to the top of your succulent plants helps keep moisture in, man oh man, that is so right. I water once a week. That's it. 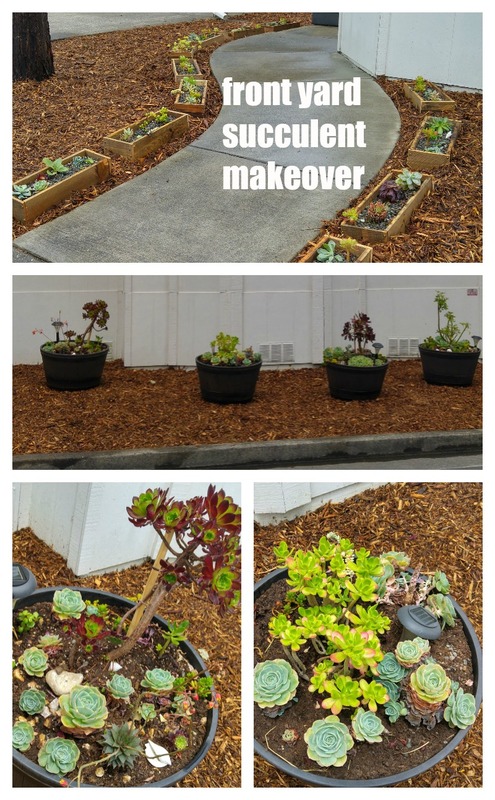 And the gravel makes them look super neat, too. Have a great summer! Thanks, Sheila. Yeah, they add beauty, are cute as heck, and ooh my, when the succulents bloom simply gorgeous and colorful. Thanks for commenting! Thanks, Sally. I do love to stay busy. lol. Yes, Melissa, I actually have a stack of paintings ready to share....gotta put my spade and clippers away and get that done!